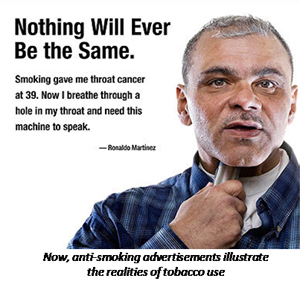 Smoking advertisements dramatically have shifted from glamorizing smoking to exposing the grim realities of tobacco use. According to the Federal Trade Commission, cigarette companies in the U.S. spend approximately $1.1 billion on marketing. Generations ago, tobacco companies advertised with messages like "doctor approved" and images of beautiful people enjoying life with cigarette in hand to increase brand awareness, preference and sales. Today, cigarette ads are one of the most highly regulated forms of marketing. Some or all forms of tobacco advertising are banned in many countries, including South Africa, Canada, and Japan. 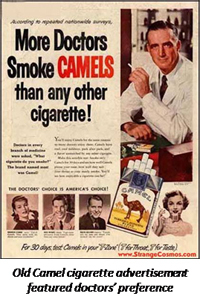 Cigarette brands frequently sponsored U.S. television programs in the 1950s and ‘60s. Marketing then spread to magazines, newspapers and billboards in the ‘70s. However, in April 1970, Congress passed the Public Health Cigarette Smoking Act banning the advertising of cigarettes on television and radio starting on Jan. 2, 1971. But as consumers continued smoking and tobacco companies acknowledged little about the health impact of tobacco use, federal organizations took an organized stand against the marketing of cigarettes. In March 2010, the Food and Drug Administration (FDA) reported that scientists had proven the link between tobacco product advertisements and promotion and adolescent tobacco use. To protect youths and adults, the FDA Center for Tobacco Products issued a new rule limiting the sale, distribution and marketing of cigarettes and smokeless tobacco. Prohibiting tobacco brand name sponsorship of any athletic, musical or other social or cultural event or any team or entry in those events. Prohibiting gifts or other items in exchange for buying cigarettes or smokeless tobacco products. Requiring that audio ads use only words with no music or sound effects. Prohibiting the sale or distribution of items, such as hats and T-shirts, with tobacco brands or logos. Now, formerly colorful store displays and ads are now in black and white, tobacco advertising is banned near playgrounds and schools and cigarette makers are required to display graphic warnings on packaging. Unfortunately, federal regulations and other efforts are just one of the many changes needed to limit tobacco use. We hope to make a change in our community by moving to a tobacco-free environment as of April 1, 2011. What do you think of the FDA's plan to require cigarette packages to have larger and more visible graphic health warnings? Please send your thoughts to tobaccofree@ochsner.org.